Tag Archive | "Strawberry rhubarb"
Are you one of those who can’t live without coffee? Does a day without it seems to be incomplete? Most people who really love coffee just can’t seem to get enough of it. In fact, the many coffee drinks are the result of these coffee lovers that are obsession with coffee. In addition to the love of ‘coffee derivatives’, coffee cakes are popular. However, what you may not know is that there coffee cakes that are available in different flavors as well. Sure… I have had coffee cake before, but what I didn’t know is that there are lots of flavors that I have never heard of. Actually, you can find a number of coffee cake recipes online! Here is one that caught my interest- Strawberry rhubarb coffee cake. Since I love strawberry and obsessed with coffee (like you! ), I wanted to check it out! In a large saucepan, combine rhubarb, strawberries, and lemon juice. Cover and cook over medium heat for about 5 minutes. Combine sugar and cornstarch; stir into strawberry rhubarb mixture. Bring to a boil over medium heat, stirring constantly until thickened. Remove from heat. In a large bowl, combine flour, sugar, baking powder, baking soda, and salt. Cut in butter with a pastry blender until mixture resembles coarse crumbs. In a separate bowl, beat together buttermilk, eggs, and vanilla. Stir into crumb mixture. Spread half of the batter evenly into a greased 9x13x2-inch baking dish. Carefully spread filling over the batter. Drop remaining batter evenly over filling with a tablespoon. In a small saucepan over low heat, melt batter. Remove saucepan from heat. Stir in flour sugar until mixture is crumbly, and then sprinkle over batter. Lay foil on lower rack to catch any juicy fruit spillovers. Bake 350? for about 45 minutes or until cake is done. Let the cake cool down in pan on rack. 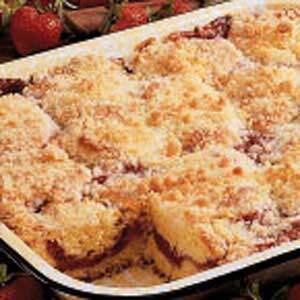 Cut strawberry rhubarb coffee cake into squares to serve. What a better way to sit and relax while enjoying a cup of coffee and a slice of strawberry rhubarb coffee cake! It seems like coffee and coffee cake makes a perfect combination, don’t you think? For more coffee cake recipes, visit cooksrecipes.com. Search for other coffee cake recipe to pair off your cup of coffee.